Marine Property Renato is a property occupying the best location in Split, marine Zenta, near 5 km beach and many night clubs around. Surrounding area is the most popular summer place for the gathering of the young locals and tourists because of the beautiful pebble and sandy beaches around and proximity of night clubs. City center is reachable within 15 minutes of walk along the beautiful coastline. Marine Property Renato has 2 mixed dorms and 1 private room, each with air-conditioning. 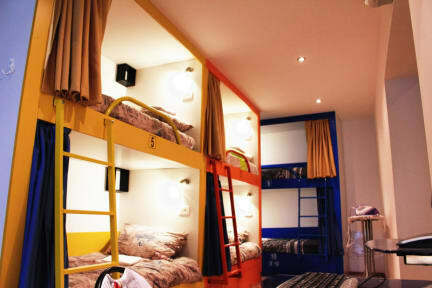 One mixed dorm can accommodate up to 10 people with 5 bunk beds, and other up to 12 people with 6 bunk beds. 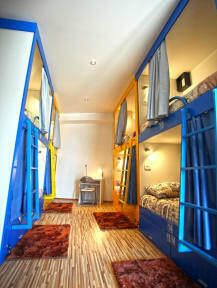 Private dorm can accommodate up to 2 people with 2 single beds. Bunk beds are designed and arranged in a way which provides a high level of privacy. Every bed is shielded by the curtain from the rest of the world. In addition, every bed is equipped with power plug outlet and reading light. Bedding comes with the beds and there is with no additional cost. Two private full size security lockers are on disposal for each of our guests together with the property safe for additional security. Visitor Tax in Split is 10 kn per person, per night and is not included in the price. All other taxes are included. The total balance is due in full at the property upon check-in. Children under 18 must be accompanied by an adult or having a permission for a stay signed by their parents. Unfortunately we are not able to accept bookings that include people older than 45 years of age, if nothing else has been agreed upon. We keep our selves right to cancel those bookings that end up outside of this criteria. Great little hostel. About 25 minutes walk into Split but it was enjoyable along the coast. Good cheap restaurant next door. Lots of locker space, the key is provided by them. Good showers and privacy curtain. Each bed has it's own lamp and plug socket. Mini market nearby too Would recommend and would stay again! Maja was very friendly and helpful! We had a great stay here and ended up extending for a few more nights. The first night we stayed in the group dorms, the curtains on the beds are a great addition. There is plenty locker space. The second two nights we stayed in the private dorm which was great, and worth the extra few euros. The whole property was clean, and close to a lot of nice beaches. The walk to downtown is a little far (25 mins) but it is nice to stretch your legs and see the town. Maja who has run this hostel for the last ten years is a wealth of invaluable information on split and what's on offer with things to do and places to go..the hostel it's self isn't massive but can accommodate over twenty poeple which is cleaned religiously daily in all area's..it's a happy go lucky vibe and easy going ..beds are comfy and the lockers are plenty full and of a good size only negative is the meeting room which is small but the restaurant next door provides good food/cheap.. The staff were so lovely and happy to accommodate me for an extra nice. It was end of the season so the hostel was pretty quiet. It’s in a beautiful location but a little far from the city centre (but it’s a nice walk so that didn’t really matter). Great value for money, kitchen didnt have a stove but had everythimg else. Comfy rooms with great view of the harbour. Would recomend. Amazing hostel .. Maja who works here is awesome .. as soon as we booked our beds she sent us an email giving us directions from the airport .. she was helpful throught our stay .. The only downside, there isn't a social place for people to get to know each other and lots of dogs around. I loved this hostel because it was away from the city center and close to so many beaches! I also LOVE the cubby beds, which make it easy to sleep in and have privacy. And the front desk was SO friendly and gave great advice on where to visit and eat. The hot water ran out almost every day, but I would definitely stay here again because the location and beds are amazing! I really enjoyed my stay, although it was quick I was picked up from the airport and taken straight to the hostel stress free and Maja the manager was absolutely lovely! Would definitely go back!